...Oh My Goddess! with police officers instead of deities. Miyuki is a down-to-business cop with a passion for her job and a mechanical streak. Natsumi is a cop, too, but her penchant is for tooling around on a moped at unsafe speeds. And together, they are Bokutoo Precinct's newest pair of partners on patrol. At least, they're supposed to be...their styles don't exactly match, and before they've even met, Miyuki ends up chasing Natsumi around Tokyo and eventually nabbing her for half the moving violations in the book--and that's on Natsumi's way to work. Thus begins the tumultuous relationship of Bokutoo's fearsome female duo. Note: This review is of the four-episode OAV series; these same four episodes make up the beginning of the TV series. Fujishima Kosuke is best known for the light romance, wacky comedy, and gentle-heartstring-tugging of Oh My Goddess! You're Under Arrest! has a slightly different story and theme, but it's got the same feeling of light-hearted fun as his other "exclamation point included" series. You're Under Arrest! 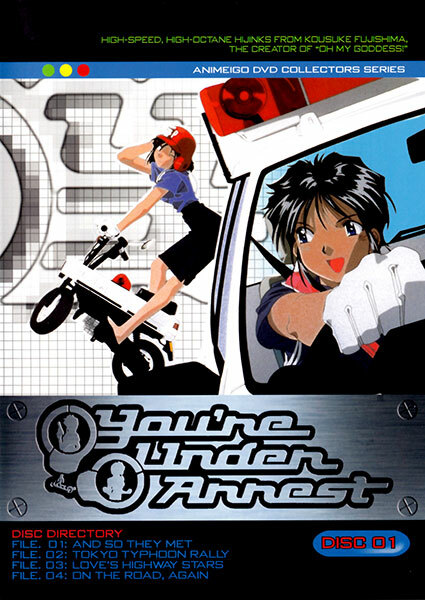 is basically the story of two young female cops: Natsuki, a hothead with a motorbike, and Miyuki, the levelheaded one with a souped up mini-patrol car that she loves like a boyfriend. They of course don't get along well at first, but after a series of adventures (none of them terribly dramatic--rescuing cats and chasing joyriders through a hurricane) they learn to live with each other, and maybe offer some assistance with the ol' love life too. The friendship aspect is formula but light and fun, and some romance covers the drama toward the end of the series. The action is also fun, but isn't what you'd call life-threatening or even all that meaningful. Still, just as Oh My Goddess! managed to turn a sweet and very low-drama love story into an endearing series, this one manages to turn a formula situation comedy into an enjoyable little ride. Visually, You're Under Arrest! is a bit heavy on the pastels for my taste but the character designs are cute and the action isn't bad at all. All in all, it's not as good as Oh My Goddess!, and its not a series for fans of drama or hard-hitting action, but it is a lot of fun to watch in spite of how lightweight it is. The original title, Taiho Shichauzo, translates literally as "I'll arrest you! ", but since it's what Japanese Police yell at criminals, "You're Under Arrest!" is an appropriate translation. One other note about Japanese cops--the mini patrol car looks pretty silly by American police standards, but Japan is a different place, and it actually isn't that far from reality (nitrous oxide booster aside). Available in North America from AnimEigo as the first volume of the TV Series box set. Was originally available on four individual subtitled or dubbed VHS tapes, or on two hybrid LDs. You're Under Arrest (OAVs) is Copyright © Fujishima Kousuke / Kodansha / Bandai Visual / Marubeni. Any images are the property of their respective rightsholders, and included for review purposes only under the fair-use clause of US copyright law.